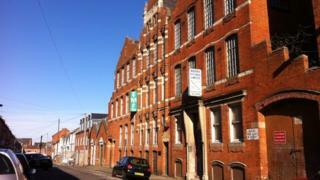 A Grade II-listed former leather works building is to be "brought back to life" as residential flats. The old Globe Leather Works factory in Dunster Street, Northampton, has been empty for years but is set to be converted into 39 apartments. Northampton Borough Council approved the plans on Tuesday, the Local Democracy Reporting Service (LDRS) said. The developer hoped work would begin this year and be finished by 2020. The site includes the neighbouring former Hawkins building, for which planning permission for 105 apartments was granted in 2016. But development has been delayed until now because a decision on the type of window replacements had not been made. Historic England was consulted on the application and said: "We appreciate certain compromises may be necessary if former industrial buildings are to be converted to residential use, but believe loss of windows would be harmful to the significance of the heritage asset." Councillors were told by planning officers that the public benefits of providing homes and bringing the building back into use outweighed the harm to the look of the building. Applicant Colin Clayson said the use of aluminium windows would provide "a consistency of aesthetic throughout the development". Councillor Jane Birch added: "I think we have to be pragmatic. Do we fight against replacement windows or bring a huge site back to life?" The application was granted planning permission unanimously, subject to agreements on window replacements with the borough council.